Janet has over 30 years experience as a nurse. For 24 years she worked as a paediatric nurse at Starship’s Hospital before moving into paediatric palliative care. For 7 years she supported children with any type of life limiting illness, and their families. 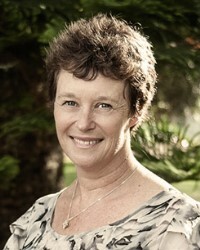 In 2013 Janet became the Director of State of Grace Funeral Services. “As Louise’s oldest sister and having been very involved in her care, I had a clear idea about what she would want for other women in the same situation. But probably more useful was that I had been an oncology nurse (although in paediatrics) for 20 years and so had a really good idea of the kinds of issues, both physical and psychological that women would face. I also had an in depth knowledge of the health system, both inpatient and outpatient, so could help the other board members understand the reality for our members”.